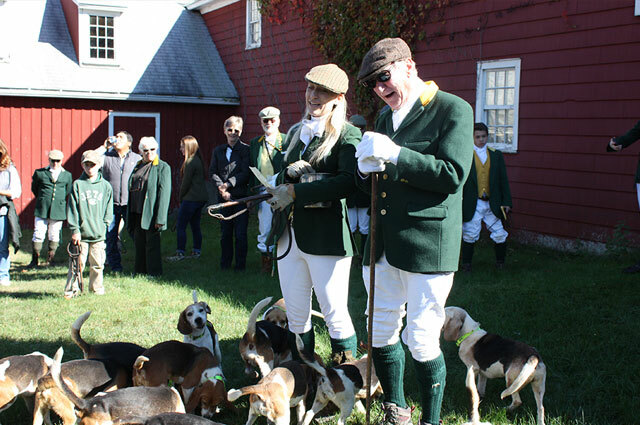 The Old Chatham Foot Beagles enjoyed a lovely season of meets, trials, shows and travel under the leadership of Master Beaglers Jack Kingsley and Jessica Anderson. Our spring season threw the usual punches of capacitating snow but also offered a few glimmers of open ground and we flew to the field whenever possible. Onto the spring show season which included a delightful joint puppy show with Millbrook and the 100th Anniversary of the Bryn Mawr Hound Show. Accolades and ribbons were received in both the beagle and foxhound ring for our efforts including a pack class win. Amidst the shows, conditioning, and training our new entries, we attended the fall and spring National trials in Virginia. Hounds performed well at both appearances, and brought home two silvers (firsts) and two overall awards. Velvet, our silver ticked veteran won the 13″ stake. The highlight of the show season however was junior Taylor Palacios receiving the Outstanding Whipper-In of the trial award. Taylor was chosen among adults and juniors to receive this award. Our formal meet season was delightful including a series of decadent teas hosted by our members. Nora Tuttle and Margot Allen were the key to the success and we thank them, our staff and membership for their kindness and support.